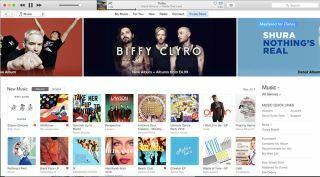 Music downloads could be no more by 2020 | What Hi-Fi? Nielsen, an American global information and measurement company, has reported that download sales in the US have fallen by 42 per cent and with the rate they’re falling, could be a thing of the past by 2020. Nielsen’s figures are for single-track download sales and confirm that purchases of songs have fallen 24 per cent, or 127.3 million, in the first half of 2016 (year-on-year). Figures also show how much track downloads have plummeted since their peak in 2012. US download sales in the first half of 2016 were 404.3 million, compared to the 2012 peak of 698 million sales. With US track sales typically costing $1.29, the drop in downloads since 2012 represents a loss of $300m a year. Since iTunes is one of the biggest music download sites, the fall in revenue is likely to have a big effect on Apple's iTunes business. No wonder that it's sniffing around Tidal with a view to expanding its Apple Music streaming service. The findings are yet more evidence to show that music streaming is growing at a rapid rate, up 97.4 per cent in the US year-on-year. Nielsen says the total number of audio streams in the US in the first half of 2016 was 113.6bn, or 431,000 streams a minute. Digital album sales aren’t safe either: sales of those fell 18.4 per cent, or 9.9 million units in the US over the past year. “If [digital album] sales continue to fall at 9.9 million units a year, they would be in single figures by 2020 and vanish by 2021,” says MBW.